Deirdre Demet grew up near the shores of Lake Michigan in Milwaukee, Wisconsin, a city well known for its penchant for bratwurst, beer, cheese, speedskating and bicycle racing. Dede—as she is known—quickly took to speedskating after her figure skating coach told her father she preferred racing around the ice. 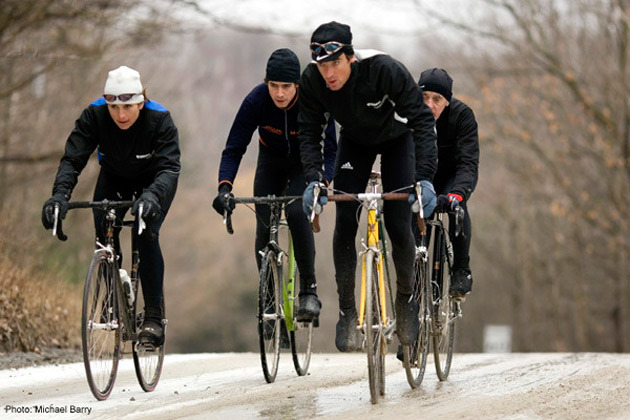 Following in the ice chips of former skaters-turned-bike-racers and Wisconsin natives Beth Heiden and Connie Carpenter, Demet raced internationally on the ice before clipping into the bike at age 17. Demet qualified for the Junior World Championships in Odense, Denmark and finished 4th in the pursuit on the track in her first season. She crashed in the road race, breaking her new Colnago frame. Carpenter, gold medalist at the 1984 Los Angeles Olympic road race and Demet's former speedskating coach, had also been the coach for the Junior Women’s National team, and took Demet under her wing. "She helped me immensely starting in 1988," Demet told me from her home in Toronto. "Connie taught me how to read the race, how to balance hard training with recovery and also the discipline needed to get the most out of my body. She also called Jim Ochowicz as soon as we returned home from Denmark. She helped negotiate a contract for me with 7-Eleven. They replaced my broken Colnago with a team Huffy (Serotta) and I was added to their Coors Classic squad and raced the week-long Colorado tour. Jim supported me through the 1989 season like a pro." With the help of Carpenter's tactical advice, Demet went on to win the Junior World Championships Road race in Moscow, in only her tenth road race. 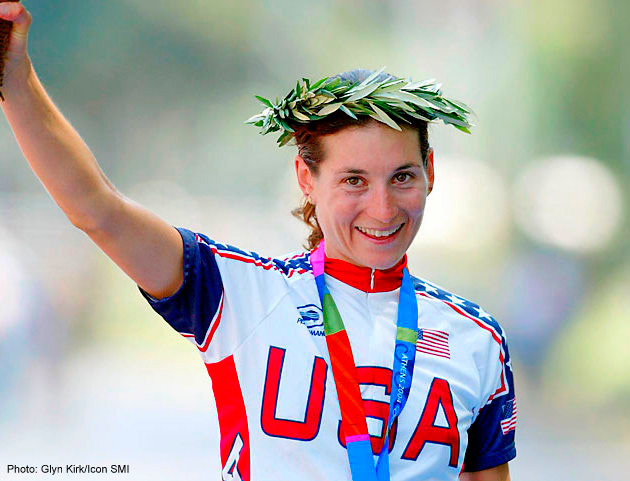 She retired after winning the silver medal in the individual time trial at the 2004 Athens Olympics. Carpenter is married to fellow `84 Olympian Davis Phinney, and is the mother of current neo-pro Taylor Phinney, himself a two-time Olympian. 1. Demet was so new to road racing at the 1989 Junior World Championships she nearly crashed in the finishing circuit due to her green cornering skills. “I remember seeing Eric Heiden race Superweek in the early '80s, shortly after he had won his five speedskating gold medals at the 1980 Winter Olympics in Lake Placid, New York," she said. "He made quite an impression on me, although I'm not sure if he was wearing a 7-Eleven jersey at that time. I also remember seeing photos of Andy Hampsten, Dag Otto Lauritzen and Davis Phinney in Winning magazine before I was asked to join 7-Eleven; but to be honest, I knew little about the sport and especially the history of the sport when I got into it." 2. For more than 40 years, the Superweek Classic has been a major cycling event in Wisconsin, and the Lake Front Road Race passed by Demet's house, who would spray water on the pros and fill their bottles. Soon the roles were reversed, and she was part of the colorful peloton, first with 7-Eleven, then with Team Saturn. "I always enjoyed doing Superweek as it was my hometown race and also the first road racing series that I had seen in the early 1980s, as I also found it to be a fun atmosphere with little pressure," she explained. "I mean, I put a lot of pressure on myself to try to win, but I always enjoyed racing on home soil. My parents had a house on one of the courses, and my brothers had houses on others in Whitefish Bay and on the Downer Avenue course, and they often had barbeques on race day. Everybody would stand on the curb, cheering us on as they drank beer and ate bratwurst. It was a fun time." 3. Demet's father was athletic, but the rest of her family was not. He played squash, racquetball, handball and swam; he was not a cyclist. Her entry to cycling was pure chance. "I had begun cycling as a form a cross-training for speedskating at the advice of Dr. Mike Woods," she said. "He started a junior cycling team, called the Brookfield Cycling team, which contained many of my speedskating companions. He held structured training sessions from his house all spring and summer. His wife, Susan, was incredibly supportive as well. She always had fresh baked cookies, chocolate milk, water and juice that she would serve to us post training. They treated us like family and were incredibly supportive." 4. 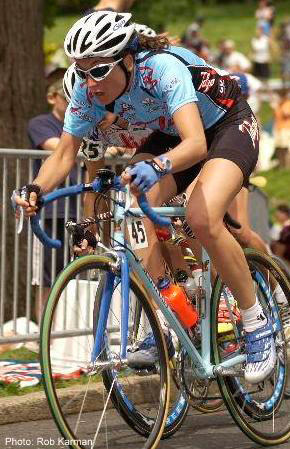 Demet met Canadian cyclist Michael Barry in 1997, when she was living in Boulder, Colorado, and racing for Saturn. "In July 1997, Michael was racing for a French team, Velo club Annemasse and came to Boulder, Colorado, to train," she said. "We became close friends and our relationship really started to blossom later that year, as he had broken his back and hip and he bought a computer during his recovery so we started emailing back and forth daily and speaking often. When he had fully recovered, I invited him back to Colorado for a visit and a year later we were married." Barry's father Mike built Demet a custom lugged steel Mariposa for a Montreal World Cup race in 2002, which she won. Demet and Barry both raced the 2004 Athens Olympics. 5. Following Barry's retirement, Demet recently relocated from Girona to Toronto to be closer to Michael's parents, who live a few blocks away. In addition to raising two young boys, Demet is working with NineSigma, an Open Innovation consulting agency, in business development. To stay fit, the 40-year-old Demet rides her Mariposa or T-Mobile issued Giant during the local Morning Glory ride which meets daily at 5:40am, and she runs quite a bit as well. “There are about 100 riders who show if the weather is decent," she said. "Most of us work, so midweek, we're back home by 7:15 or 7:30. It's a good community of people who have a lot of fun on their bikes and it’s a nice way to start the day. The community here has been very welcoming, and I’ve been fortunate to meet some great women to ride or run with every morning." One well-intentioned rider asked Demet if she knew how to ride in a paceline during her first time with the group, not realizing Demet's pedigree of racing 16 years at an international level against the likes of Catherine Marsal, Clara Hughes, Leontien Van Moorsel, and Jeannie Longo.